The Harvard University master plan is one of the several projects up for review on Thursday. If Boston’s streets already seem crowded with construction sites, get ready to squeeze in a few more. The Boston Redevelopment Authority is poised to approve several major developments on Thursday, including a 52-story residential and retail tower at Copley Place, an 11-story office building in the South End, and a 283-unit apartment complex in Jamaica Plain. The authority is also scheduled to take up a long-term plan for Harvard’s expansion into Allston, where the university is planning academic buildings, athletic facilities, and hundreds of residences. The projects would add to a burst of building activity in recent months, as developers try to seize on the city’s hot real estate market and lock down approvals before Mayor Thomas M. Menino leaves office at year’s end. Both candidates to succeed Menino are proposing to significantly overhaul the BRA, which could delay the city’s review process. As the mayoral election approaches on Nov. 5, the BRA has increased the frequency of its board meetings, holding three sessions in the past four weeks. It typically holds one meeting a month. The projects up for approval Thursday would result in construction of more than 850 additional residences in the city. Some of the proposals have been under consideration for just a matter of months, while others have gone through lengthy multiyear planning processes. The 52-story skyscraper at Copley Place would account for 542 of those units. The tower, proposed by Simon Property Group of Indianapolis, would be among the tallest residential buildings in the city, with about 433 rental apartments and 109 condominiums. In 2011, the BRA approved a prior version of the project that called for 318 condominiums. But the developer failed to move forward and then revised the project to include a large number of rental units. State Representative Byron Rushing of Boston said he supports the new design, but wants the developer to increase the percentage of affordable units. Currently, 15 percent of the homes, or 71 units, would be designated affordable, which meets the city’s minimum requirement. Rushing said he would like state and city regulators to push the developer to 25 percent. Simon Property Group did not respond to Rushing’s request Wednesday, saying only that the 71 affordable units will be contained in the rental portion of the project. A spokeswoman for the Massachusetts Department of Transportation, which owns the property, said it is still reviewing the development plans with Simon executives. “We are actively discussing ways with the developer that we can maintain a strong commitment to affordable housing,” said the spokeswoman, Cyndi Roy. She declined to comment on the 25 percent figure suggested by Rushing. The BRA board will also take up two projects that have been fast-tracked through its review process during the past few months. Both projects, The Commons in Jamaica Plain and 80 East Berkeley St. in the South End, were included in prior long-term planning initiatives led by the BRA. The Commons would result in construction of 283 apartments on a former petroleum depot near the Forest Hills MBTA Station. The project, which includes retail space and a public park, was part of a community process in 2008 that recommended dense development around the T station. The projects up for approval Thursday would result in construction of more than 850 additional residences in the city. The 80 East Berkeley project, proposed by developer Ronald Druker, would replace an auto detailing business in the South End with more than 300,000 square feet of office space; the building would contain stores and restaurants on the ground floor. Some neighbors have objected to the height of the building, which is surrounded by mostly low-rise residences and commercial structures. Other residents have offered support, saying the project will improve a now scrubby-looking property in the neighborhood. Although the project has been pending for only four months, it comes after the BRA convened a three-year planning effort to revise zoning rules around Druker’s proposed building. Several developers are either building or seeking approval for large-scale housing developments in the area. Druker’s proposal fits within the new zoning limit of 150 feet for his property. Of the proposals up for approval Thursday, Harvard’s expansion into Allston has been under consideration the longest. The university has been meeting with neighbors on its plans for more than six years. 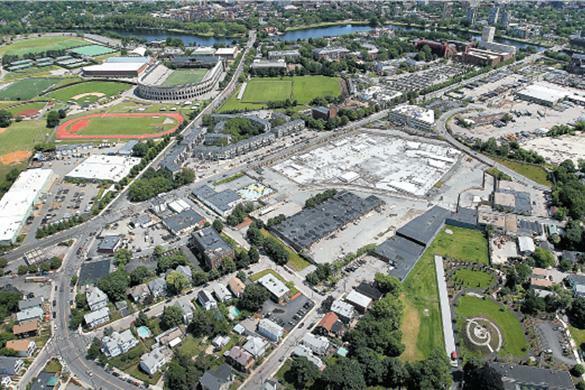 The expansion calls for more than 1.4 million square feet of development, including a new basketball facility, an addition to Harvard Stadium, several academic buildings, and a hotel and conference center at Western Avenue and North Harvard Street.